Strokes are commonly caused by a blood clot. The brain is then deprived of blood flow and oxygen. Without intervention, the lack of oxygen causes cell death within the brain. This can have significant impact on speech, motor skills, and cognitive abilities. About two-thirds of survivors need stroke rehabilitation to recover from the effects of stroke. Stroke patients can come to Auburn Village to start intensive therapies aimed at restoring neurological function. For most patients, recovery from stroke takes six months to one year of focused, intensive rehabilitative therapy. 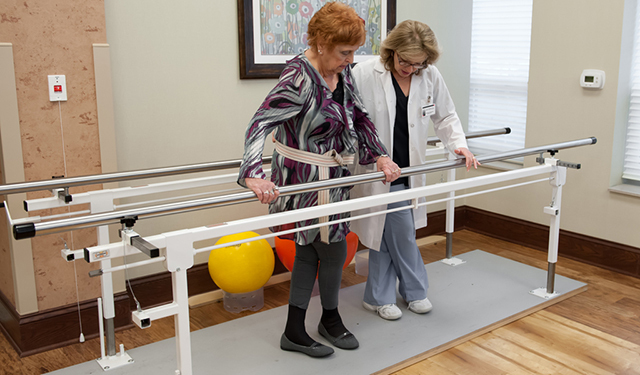 Why Choose Auburn Village for Stroke Recovery and Rehabilitation? Auburn Village offers comprehensive stroke rehabilitation. Our highly trained, professional staff provide an individualized care plan that promotes a return to independence and home. Our program is provided by an experienced staff that focuses on individualized needs as directed by each resident’s primary physician. Everyone works together as a team to help accelerate your recovery. For example, our licensed Physical Therapist will help restore strength and improve functions of daily living. Our licensed Occupational Therapist will teach life skills to help promote mobility, strength and independence to perform routine daily tasks after an injury or an illness. Then, our licensed Speech Therapist can help recover speaking and swallowing ability along with communication skills.